SWFA SS 1-4x24 in their SSALT mount. 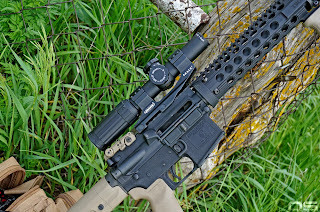 I only recently discovered SWFA and I think maybe it is because their products fall just at the top end of what is considered "budget", and so fewer people talk about them when inexpensive optics are the topic of conversation. While digging for reviews and general interwebs trolling, I just don't think I ever came across an SWFA optic. I probably did and just dismissed it for whatever reason. It seems there are a handful of go-to budget friendly optics in the 1-4 magnification range, particularly with the popularity of 3-gun in recent years, and those offerings get all the airtime. 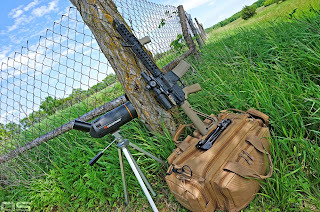 A few months ago I also discovered TiborasaurusRex on youtube and let me tell you, you don't have to watch his channel long to realize that he knows just about all there is to know about optics and long range shooting. TiborasaurusRex talks about SWFA SS optics in a couple videos but he has one in particular discussing how they're made, and just exactly what makes them one of, if not the, best choices available. There isn't much point for me to try to explain it, just click the link and watch, but the bottom line is that you are getting a lot of features that matter at a very good price point. It seems there is a group of people sort of "in the know" when it comes to SWFA and the release of this particular optic was apparently highly anticipated and they sold quickly. I ordered mine when they were out of stock and just got it a few days ago, after waiting for the ETA, which I might add, was accurate. Either I have bad luck - entirely likely - or no one delivers on their promises in the manufacturing world, because any time I order something on back-order, the estimated time of arrival isn't even close and I wait around itching to furiously post a negative review. So, first thing that needs to happen, is lay out the framework for this review. My framework is kind of like cobbled together in a back alley garage with duct tape and stolen parts. I've shot and hunted all my life, but I'm not saying it was correctly, you know, if I was going to be honest with myself. Shooting for me has always kind of been an organic or natural sort of activity and while I think it does come naturally for me, I'm not saying that. I'm saying, more of an art and less of a science. Bird hunting and point-shooting has always been more my speed and so moving from the hunting realm of shooting and into the realm of action shooting I took more to pistols than rifles. 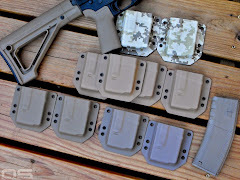 I know I'm speaking broadly here, but we're talking about going from the traditional to the modern tactical. It's a whole lot of words to say, I've only had my AR variant rifle for a few years, and in that time, I just haven't spent a lot of time shooting it. Without a doubt, a healthy dose of human error is going to be apparent in the results throughout this post. What I have done though, is spent a lot of time changing optics and trying to figure out what optic is right for me. I started with a 1-4x, then switched to a micro red dot, then shot iron sights for a little while, and now I'm back to 1-4x. 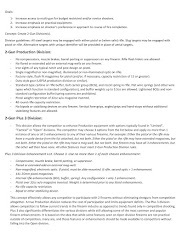 What I realized about the Primary Arms 1-4x I originally had is that it didn't provide any opportunity to employ or learn precision shooting techniques, and a variable power magnified optic is too heavy not to provide more flexibility. The micro dot took care of the weight issue, but I still felt my gun should wear more hats and I wanted to learn at least some basic precision shooting fundamentals. If the gun was going to be heavy, I decided it should be flexible and I should have access to all of its potential. And on the subject of potential, there is only so much of it available in the equipment. You're looking at a chrome lined, 1:7 twist Del-Ton upper with their heavy barrel and a 5.56 chamber. The lower is a PlumCrazy from before the company turned into New Frontier. I don't know how it will hold up over time but what I do know is that I can't really complain a lot about the trigger. There is almost no movement before the break. You apply five or five and a half pounds of pressure to it and the gun fires. The reset, therefore, is brief with an unmistakable and audible thunk, as plastic things move into alignment under spring pressure. I shot from prone with a UTG bipod and without a sandbag (and I will in the future) while testing inexpensive ammo not necessarily intended for precision. I recently put the Troy Delta rail on for the purpose of free floating the barrel. What it all amounts to, is not a sniper rifle. 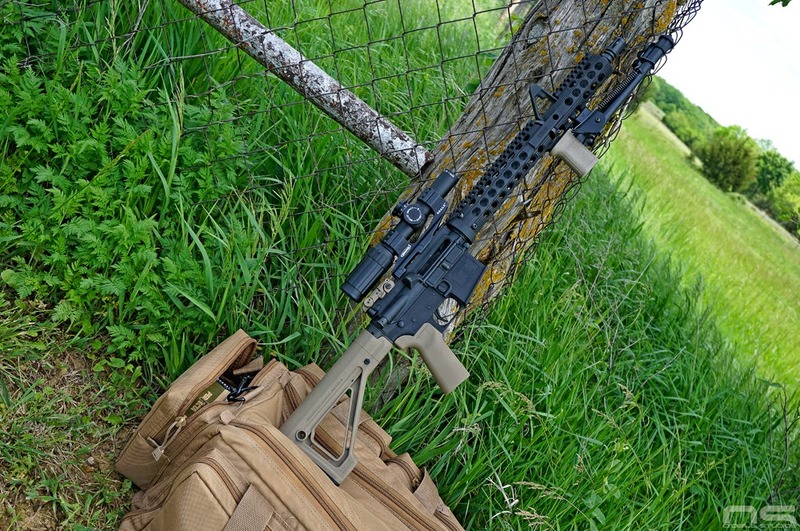 My point here is, this is the rig, the reader should understand that it's an inexpensive, general purpose rifle. In that regard, this is as much a test of the rifle and ammunition as it is the optic. And with that said, let's get into it by talking about all of the parts as a whole, rather than the optic alone. I think the do-all gun is highly sought after, but difficult to achieve. 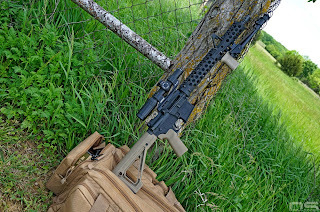 However, with the 5.56 AR platform the main outer boundary seems to only be the cartridge's effective range. Its lethality has throughout history come into question as well, and many alternatives have come and gone, but I'm personally past that and I define do-all as general purpose, or multipurpose, in a less literal sense. Why? Because I think that is what the 5.56 AR carbine essentially is and always was. 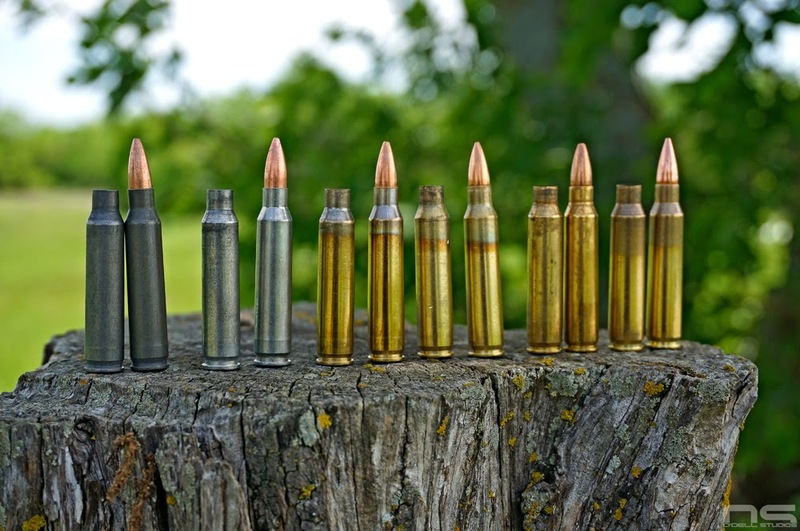 Undoubtedly a better, more multipurpose gun and cartridge could be made, but it won't be without significant alteration to the rifle and cartridge - a complete system, one made specifically for the other. So general purpose takes on new meaning for me as a civilian. What all can I get from one gun for my money? Can I hunt? Can I do some precision shooting? Can I put it into some action shooting? Can I use it in a defensive role? 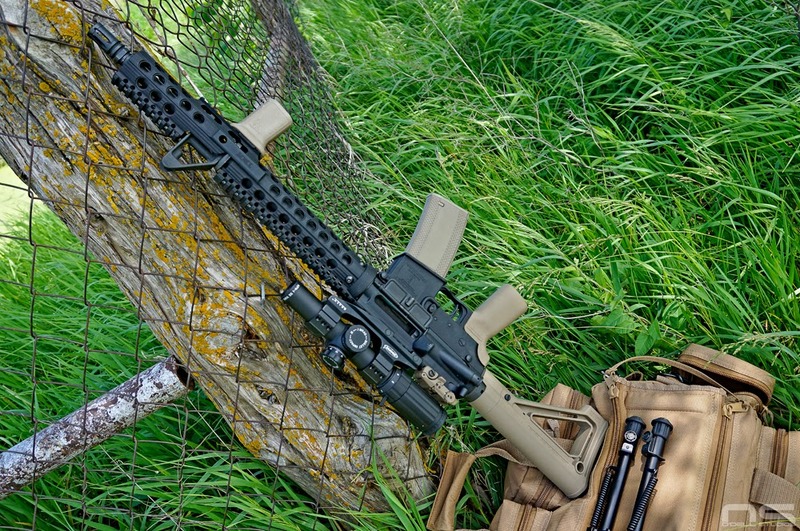 So today, we're talking about the precision aspect, and where a rifle might begin to take on a niche role at the expensive of versatility. All 55gr FMJ, except the Colt brand in 62gr. With six brands of inexpensive cartridges from four different countries in hand, I set to zero my new SWFA optic and find out what accuracy potential my gun possessed. As this is an introduction, and a violently stormy day here in Kansas, I only got into the basics at 50 yards. Out of the package the SWFA 1-4x24 looked and felt like a well made product. On one power magnification the front sight post is visible and I immediately noticed that the optic had to be very close to zero right out of the box given the reticle's position relative to the front sight, and it was. You will see in the pictures, after a quick bore sighting by eye, the first round hit just to the left of the target, maybe an inch or so. The second round was a dead center hit, both Russian Tula .223 55grain FMJs. At 50 yards, measuring mils is cake and the total windage adjustment out of the box was 1.7 mils. Now, I already know the Tula is not spectacularly accurate in general and not out of my gun. So I only shot two rounds to sorta zero it, and then began shooting groups of the other brands. Two points to really drive home there. No elevation adjustments, two rounds, and this optic was zeroed, firstly. And second, that dead center bull's eye was probably a fluke. I doubt very seriously if I had fired two or three more rounds that any of them would have been in the black. For reference, those are 3 inch circles and the diamond in the center is a half inch square. 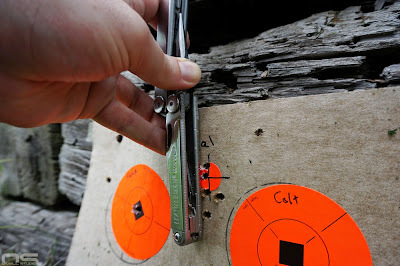 At 50 yards the center dot in the reticle completely covers a half inch square and the 3 inch radius of the target is equal to the width of the diamond in the reticle. Knowing that I was looking at an effective range for .233 or 5.56 of 500-700 yards I couldn't justify spending a whole lot on a bi-pod and to be honest, the main feature I looked for in this unit was the QD mount. I just don't want that extra weight hanging on the front unless I am doing that sort of shooting so the ability to quickly remove it took priority over everything else. I have to say though, the UTG bi-pod, being a direct Harris knock-off, is more than sufficient for my needs. It only swivels and I know that's not good enough for some precision shooters, but I found it had enough play to lean into it, to load the bi-pod, and it seems very sturdy. The throw lever has no locking mechanism and I've already found the screw to adjust the lever likes to back out. I put some thread locker on it, and we'll see how that works out over time. I don't have any experience with $1,000 glass, so all I can say is, looking through this optic is like looking through air. Bright surfaces in bright sunlight seemed equally bright through the scope as if the light were passing perfectly and completely through the glass. Nothing seemed lost. The eye relief is forgiving and while wearing prescription glasses always seems to be an obstacle with optics, it was less so in this case. Each time I look through a more affordable optic that has a reputation for having good clarity for the price, I wonder what else could I possibly need in that department, and the SWFA is another one of those. The reticle is sharp as a razor. I have begun to get the impression that the batteries included with these types of optics are half dead right out of the package, but the illumination wasn't visible during the times the sun actually reared its head today. I may pick up a fresh battery to try in it, but the illumination isn't an overwhelmingly significant feature for this sort of shooting. Now for the ammo testing part of the day. I think the big surprise was the Russian, Colt branded cartridge which I believe has a 62 grain projectile. I must have thrown the packaging away, but it's the stuff that comes in a blue box. It grouped as well as any, maybe as well as the ZQI, maybe better, depending on how much shooter error factored into each group. And there was plenty. Without a sandbag, prone in the grass, I could clearly see my heart beat moving the reticle. Additionally, my target choice wasn't among my finest, being about the same size as the reticle, making it difficult to achieve absolute consistency. I noticed that the Winchester grouped pretty well, but then opened up for the next group. Undoubtedly the blame there could be put on the guy behind the trigger. 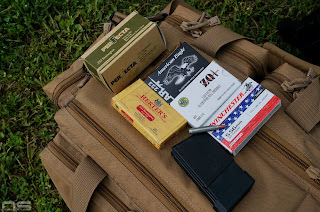 I only shot a couple Tula, because I have burned lots of it and I kinda know how it goes in my blaster, then the Russian Colt, Perfecta, ZQI, Winchester, and American Eagle. I shot 3 rounds of all of them (and failed to get a picture of only 3 ZQI rounds) then went back and shot 3 more. I did this because I just wanted to take a little of my own error out, or at least spread it around and see some more consistency, particularly with the Perfecta. Turns out, it didn't help with the Perfecta either. My gun just doesn't like it, or it just isn't that great. Now, it's important to note, the second string of fire was AFTER an elevation adjustment on the optic. So I shot 3 rounds of all, noticed they were consistently low, dialed in .3 mils adjustment, and shot the next 3. So you will notice all of the impacts are slightly higher and on the ZQI target, the top 3 are the second group of 3. I shot all 6 American Eagle at once. I also already knew it wasn't great through this gun, and it shows in the group. In any case, the ZQI promises 1 MOA right on the box, and the bullets actually do look different, and very consistent when compared to the others - just a bit more pointed I think. And it looks like they may deliver on the 1 MOA accuracy claim. I can only presume the 62 grain Russian projectiles are a little longer, possibly with a better ballistic coefficient than the others, but surprisingly good. If or when (hopefully when) I get to stretch my gun out, I will for sure consider them. 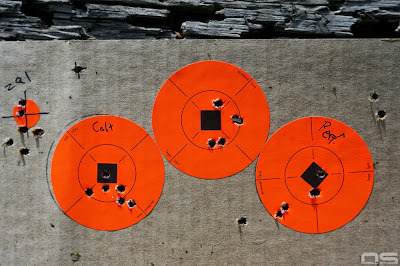 In any case, the good groups you see on these targets are about 3/4 inch, maybe a little better. Considering the shooter and the equipment, I am happy with these results. At 100 yards, if I do my part, with a sandbag and without the hurricane force winds that accompanied the T-Storms today, I think 1 MOA is realistic. 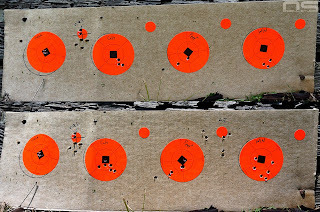 In the top row, from the left, you see my first round of Tula off the target, high and left. The second shot is dead on in the black. That was my two round zero, making only the 1.7 mil windage adjustment, and I loaded up the Colt, ultimately shooting 3 rounds of each except the American Eagle - I shot all 6 of those at once. One thing to note is a bullet hole above the Colt target - that hole was already in the cardboard from a previous shooting session and in the lower image I put a mark through it so I wouldn't get it mixed up with anything. The dark spot at the top left and lower right on the cardboard are nails holding the target up - pretty sophisticated stuff here. Next, I made a .3 mil elevation adjustment and shot 3 more of each brand - lower row. This image was an attempt to depict the group size - about 3/4 inch for each 3 shot group. I added a target and shot 5 rounds of ZQI. Probably illustrates shooter ability more than ammunition consistency. In conclusion, I think it's worth circling back to precision at the expense of versatility. It's well known that the Stoner rifle has an inherent accuracy factor so it's not as if we're seeing something unusual in my results. I learned a little something about my own setup, its accuracy potential and how less expensive ammunition performs in it. I think it illustrates how multipurpose the AR rifle is. 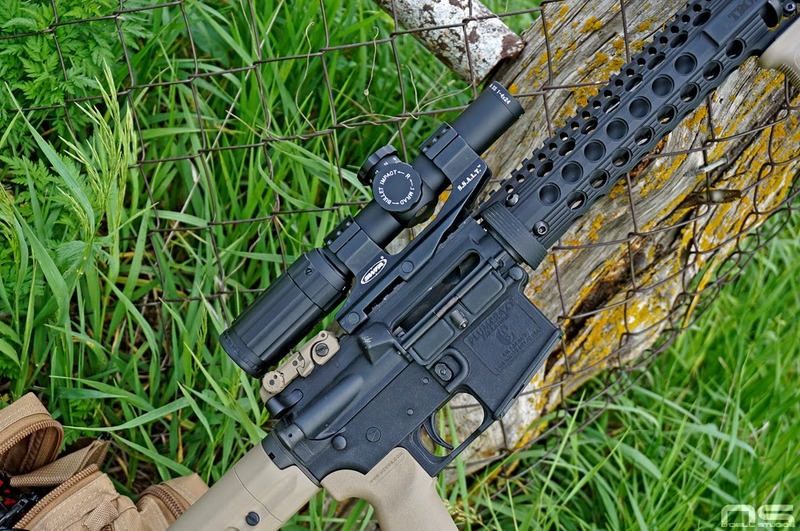 A precision barrel, internal components and optic with greater magnification might yield much more impressive results but it likely would come at the expense of versatility, particularly where the optic is concerned.